"Greeting books" offer more than a card, for less money. And, now you can express your exact sentiments in a beautiful, 40-page hardback gift book with eye-catching covers and a free mailing envelope-all for less than the cost of most greeting cards. 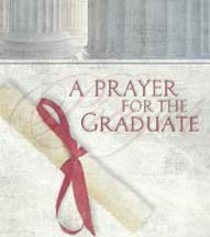 A Prayer for the Graduate offers encouragement for graduates transitioning to adulthood. - Publisher One glance at Barbour's brand-new DayMaker gift books, and you'll say "Wow!" These gorgeous, 32-page, full-color gift books feature inspirational text for moms, dads, and graduates. Carefully selected photographic illustrations complement the text perfectly, while the hardback covers include special touches such as gold foil application. A tastefully designed envelope is included with each book, making the DayMaker program an even more incredible value. Only Barbour Books can bring you this amazing package for just $2.97! About "A Prayer For the Graduate"
One glance at Barbour's brand-new DayMaker gift books, and you'll say "Wow!" These gorgeous, 32-page, full-color gift books feature inspirational text for moms, dads, and graduates. Carefully selected photographic illustrations complement the text perfectly, while the hardback covers include special touches such as gold foil application. A tastefully designed envelope is included with each book, making the DayMaker program an even more incredible value. Only Barbour Books can bring you this amazing package for just $2.97!